On Saturday 23rd June 2018, members attended a memorial service in memory of Cpl Scott Wilson, in Edinburgh East Cemetery, who was tragically killed at the battle for Mount Longdon during The Falklands Conflict in 1982. 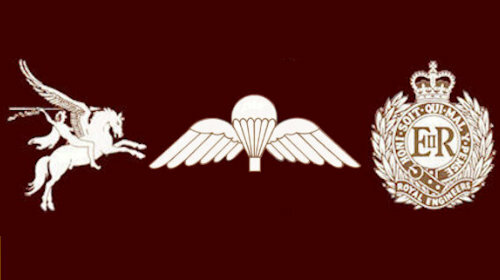 Scott was a member of 9 Sqn attached to 3 Para at this time. We were also joined by John Ferry and his wife Sandra as well as Paul Moore. John and Paul served beside Scott Wilson. After the ceremony we all retired to The Guards Club where we had a nice finger buffet and a few drinks in memory of Scott. Some of our members travelled a round trip of 250 miles to attend this ceremony. This does not take into account the fact that John Ferry travelled from Aldershot and Paul Moore from Durham. Member's wives were also in attendance. This is a ceremony that we, at AEA Scotland, feel very privileged to be able to attend and will continue to do so. An Armed Forces Day Parade was held in Edinburgh on Saturday 30th June 2018, where some of our members met up with our PRA Lothian Branch colleagues. This was an enjoyable day especially the free food and drink that was on offer after the parade. After our OGM on Sunday 15th July we attended an informal presentation on the exercise, held in 1974, at Kiel Canal where members of XV Para were killed. This was a presentation of the reports submitted by The British Army Officials and the Representatives from other countries (mainly German) who were involved. We found it very informative and educational as well as a good demonstration of "covering your back" techniques. Saturday 1st September our branch held our annual lunch at The Royal Scots Club, Edinburgh, which was well attended. As usual the ladies were very well turned and we all had a good time. 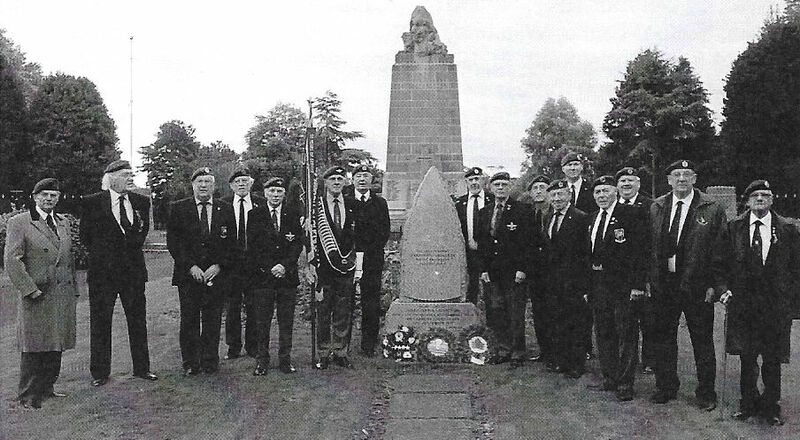 A memorial service was held on Sunday 23rd September 2018 at Zetland Park, Grangemouth in memory of the 10 No Sappers who were killed whilst participating in the exercise Trent Chase" in 1975. We had representatives from AEA Scotland, PRA Lothian Branch, RBL Grangemouth, The Falkirk Sappers and some independents. In attendance were various standard bearers as well as members of the public. During the service we had input from a piper and bugler. The Piper (Colin Campbell') is an Ex 9 squadron member who lives in Bedford. He is a friend and colleague of one of our members, Alex Cockburn (Ex 9 Sqn).The piper made the round trip at the request of Alex, for which we are very grateful. Wreaths were laid by members of the above organisations as well as a wheelchair bound lady representing the lnness family and also by a member from another family. Some members attended an Old Comrades Dinner at XV Para premises in Houldsworth Street, Glasgow on Saturday 20th October giving us a chance to meet up with some old friends from XV Para. Members attended the opening of the Garden of Re membrance at Princes Street Gardens, Edinburgh on Monday 29th October 2018. As usual this was dry but very cold and windy day, not for the faint hearted. 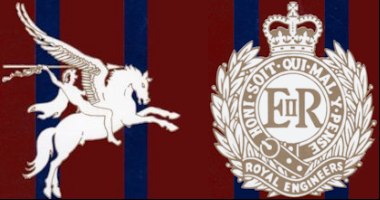 On 2nd November 2018 a member of our branch, John Donaldson, received a letter from The Ministry of Defence via Angus Mac Neill MP to the effect that those members of 300 Parachute Field Squadron Royal Engineers who were killed and wounded in action at Al Milah, Radfan on 12 April 1965, will now receive the General Service Medal 1962 with Clasp South Arabia. This comes 53 years late, but better late than never. John has informed Eoghann Maclachlainn and will inform the late WO2 John Lonergan's son. He will have to continue this fight for the rest of the squadron. John Donaldson has been campaigning for this award for several years and it is good to see it come to fruition (even partly). Well done John! Unfortunately members from our branch could not attend the Remembrance Parade held at The Cenotaph, London this year due to a combination of over larger than normal applications to attend coupled with a cut back in allocation of tickets by The Royal British Legion. However members attended local parades and services where possible. In particular two of our members attended a memorial service in Tenerife, whilst on holiday there. Sunday the 18th November 2018 was our Annual General Meeting where, amongst other things, new Office Bearers were selected for the year 2018-19. There will also be a presentation to Ronnie Drummond the recipient of the Presidents Commendation for service. Ronnie has been a member of our branch since its founding. He served in Korea as well as other areas. We will complete our year by attending the PRA Lothian Branch Christmas Dinner and Dance, on 7th December 2018, where a good time, I am sure, will be had by all. We finished off 2017 by attending the P.R.A. Lothian Branch, Christmas Dinner Dance held at Royal British Legion, Rodney Street, Edinburgh on Friday 8th December 2017 where we all (ladies included) had a very good time. As usual we won a few raffle prizes. 2018 has seen the start of a New Year and before we knew it we had our first meeting in January. Unfortunately we had to cancel our March meeting due to severe weather conditions, which was rescheduled for 15th April 2018. On 20th May 2018 after our regular meeting we were treated to a presentation, by Lt Col. Chris Warhurst (Airborne Engineers) Army HQ Andover, of his time in Afghanistan coupled with the current equipment and capability of The Royal Engineers. He presented some airborne vignettes on Herrick 4 and also spoke about the future of The Corps. He is currently in charge of all the equipment used by The Royal Engineers. Members from PRA Lothian Branch were also in attendance. This presentation was a great success and much appreciated by everyone present. Unfortunately the severe weather conditions, over the last few months, has curtailed our activities. On the 12th June 2017 members attended a memorial/wreath laying ceremony in remembrance of Corporal Scott Wilson (Ex 9 Squadron) who was tragically killed at the battle for Mount Longdon during the Falklands campaign. Paul Moore and Charlie McColgan travelled up from Durham to pay their respects as they had fought alongside Scott during this battle. 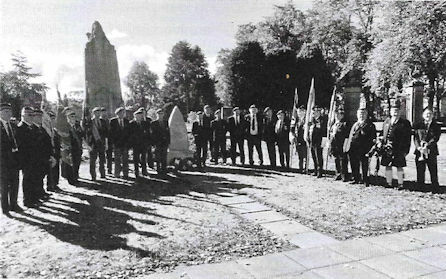 The ceremony was held at The Eastern Cemetery, Edinburgh at 1300hrs. We then retired to The Guards Club where we toasted the memory of all the fallen service personnel. 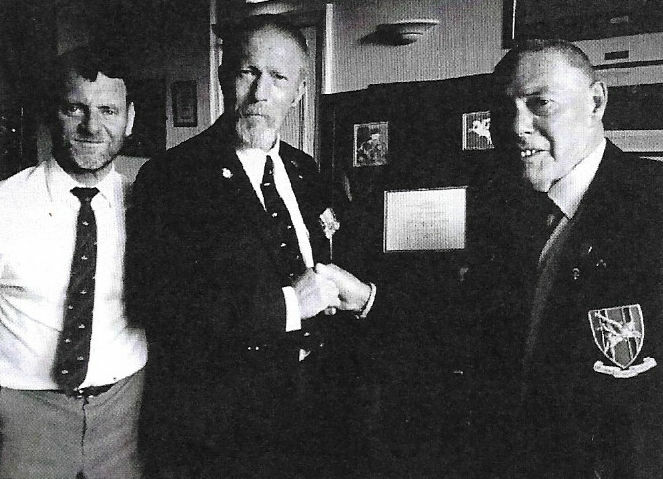 Paul and Charlie presented our Chairman, Douglas Archibald, with a photo montage regarding Scott Wilson which was gratefully received and will be hung at our meeting place of RBL Rodney Street, Edinburgh. "We will remember them." Armed Forces Day was held in Edinburgh on Saturday 24th June 2017. Members who attended joined up with some of our colleagues from PRA. Lothian Branch .We met at Johnstone Terrace, Edinburgh at 1100 hrs and marched off at 1130hrs.to the City Chambers. Thursday the 3RD August saw the "Westies" (West Coast members) meet up in a local hostelry in Glasgow for a pub lunch and a few refreshments. Some of the East Coast members were also in attendance. We had a very good social day. On 25th August some members met up with Alan Lochrie, RBL Grangemouth to finalise details of our remembrance service being held at Zetland Park, Grangemouth in memory of the 10 sappers killed whilst participating in Operation Trent Chase in 1975. While we were there our Chairman, Douglas Archibald, presented Alan with an Airborne Engineers Association Crest as well as crests from XV Para and The Cameronians ( Scottish Rifles ) Regiment. The last two were donated by one of our members, Gordon McLeod. Our annual lunch was held on Saturday 2nd September 2017 at The Royal Scots Club in Edinburgh. The lunch was very well attended and the ladies were a credit to everyone .This was the most attended since we started having these lunches and it was gratifying to see such a good turnout. Some of the ladies who attended had lost an AEA Scotland husband or partner and were invited along as guests of our branch. It was good to see them attend. A Remembrance / Wreath laying ceremony was held at Zetland Park, Grangemouth, on Sunday 24th September 2017, in memory of the 10 Sappers who were tragically killed whilst participating in "Operation Trent Chase" in 1975. This was well attended as The Royal British Legion supplied a piper, bugler, standard bearer party and a contingent from RBL Grangemouth formed an additional honour guard .The local Cadet Forces (Army, Navy and Airforce) plus standard bearer were also in attendance as were some members from PRA Lothian Branch including their standard bearer. We also were privileged to have a 95 year old Sapper (non para) who turned up to pay his respects. There were also miscellaneous personnel in attendance. When we were back at The RBL Grangemouth one of the members thanked us for remembering her brother (Raymond Buchanan) who was one of the sappers killed. We did not realise that she was a relative and were gratified to receive her thanks .There were approximately 50 personnel on parade. Although we at AEA Scotland had a lot of members missing due to illness, etc. we still had a good turnout. Some members travelled from Coldstream, The Borders and other distant places to attend. It was agreed that we keep this format for years to come. We were informed that Frank Murray (Ex AEA Scotland Chairman) had passed away suddenly as well as a former member Peter Watt-- details in the Obituaries Section. Some of our members attended the Airborne Engineers Association A.G.M. at Hull and had a very good time. The Field of Remembrance, Princes Street Gardens,Edinburgh was officially opened on Monday 30th October and some members, from A.E.A. Scotland were in attendance. This was an all services gathering and it was good to see a fair show of "Cherry" Berets. The Cenotaph Parade, London was held on Sunday 12th November and 4 members (Craig McQuade, Gordon McLeod, David Henderson and Gil Nicol) attended. It is always a privilege and honour to be allowed to participate in this memorable event. AEA Scotland has been meeting regularly on the 3rd Sunday of the alternative month of the year with our forthcoming AGM to be held on Sunday 19th November 2017 at The Royal British Legion, Rodney Street, Edinburgh at 1230hrs. Friday the 8th December some members will attend the PRA. Lothian Branch Christmas Dinner/Dance with their wives or partners, where they will hopefully have a good time and win some raffle prizes. Best Wishes to our colleagues South of the Border. "A Merry Christmas and A Guid New Year to Yin and A' "